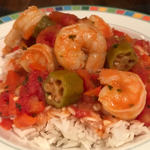 I haven’t made a recipe video in a while, so today I thought I’d present the recipe my wife and children love the best Shrimp Gumbo. The feature is definitely the shrimp, but the sweet and yet hot sauce is pretty amazing on its own. I cam up with this after my family watched The Princess and the Frog. My one daughter is lactose intolerant and the other hates sausage, but they both love shrimp and so that is how we got Shrimp Gumbo. The recipe follows the video below.